There has never been an athlete as dominant in any event as Iolanda Balas, born 1936, which is ranked as the best female high jumper of all time in the book World's Greatest in Athletics. The Romanian won 150 competitions between the Melbourne Olympics in 1956 and 11 June 1967 without defeat. During that run of victories she almost always won by a large margin. In ten major competitions in that period she won all but one by a clear margin, averaging 1.79 to her opponents 1.698. She used a technique which was a cross between the Eastern cut-off and the scissors, but it was quite primitive. It was her physics that was her biggest strength – she was 1.85m tall with 99cm of that being her legs. At the end of 1963 Balas had jumped 1.80 or higher in 72 competitions, yet it was not until 27 Sep 1964 that another women, Michele Brown, AUS, jumped as high. By the end of her career Balas had jumped 1.80 or higher in 94 competitions while the rest of the world had a count of five between them. Balas won two Olympic titles and two European titles and set 14 world records from 1.75 in 1956 to 1.91 in 1961. She has a three page biography in the book World's Greatest in Athletics where she's #1 on the top-10 ranking list which include names as Heike Henkel, Blanka Flasic, Ulrike Meyfarth, Sara Simeoni and Stefka Kostadinova. You will also find Balas in the all-time-list in the book where her PB of 1.91 from 1961 make her #400. Iolanda Balas died on 11 March following gastric complications. She was 79. Kenya is truly one of the best countries when it comes to middle and long distance running with great names as David Rudisha, Asbel Kiprop, Eliud Kipchoge, Paul Tergat, Samuel Wanjiru and many others. But the event that Kenya has dominated the most is 3000 m steeplechase where they have no matter than five men on the top-10 ranking list which is published in the book World's Greatest in Athletics. The number 1 steeplechaser is Moses Kiptanui who had his prime time during the 90's when he won three World titles, set two World records and became the first to run a sub-8 minute time. That was in Zürich in 1995 with 7:59.18. Kenya has dominated the event since the beginning of the 1990s and has occupied the whole podium three times in the Worlds (1997, 2007 and 2013) and twice in the Olympics (1992 and 2004). The number of double victories is twelve (7 at Worlds and 5 at Olympic Games). On the women's side Kenya has been less successfull but have some great names in the ranking such as Vivian Cheruiyot (3000/5000 m), Catherine Ndereba and Tegla Loroupe (marathon) and Milcah Chemos who is ranked #2 in the steeplechase. Who’s the greatest 1500 m runner of all time? 1500 m has been on the Olympic program in all games since Athens 1896 and it’s one of the events where the competition is the hardest. Until 2015 31 men have ran sub 3:30 and 450 under 3:36. Hicham El Guerrouj (MAR) is the world record holder since 1998 and the current record is 3:26.00. But who is the greatest 1500 m runner of all time? In the book World’s Greatest in Athletics you will find the authors top-10 best of all-time based on honors won, but to get something to compare with we asked statistician Ken Nakamura (USA) to put together his top-5 list. – It was not easy but I picked Herb Elliot for the number one spot since he dominated his era at 1500 m and 1 mile completely. He won the Olympic title in Rome 1960 with the a world record time of 3:35.6 and was the world record holder for a total of nine years. He also held the mile record (3:54.5). I wish he had continued to Tokyo in 1964, then I would have been able to see him in action, says Ken who was born in Japan but have been living in California for many years. – For second place I choose Hicham El Guerrouj. He is the greatest miler/1500m runner I have seen in person. I was fortunate to see him in action many times. For third spot Ken picked the current IAAF president Sebastian Coe who won the Olympic title at the distance in Moscow in 1980 as well as Los Angeles in 1984. – I value Coe’s championships performances high, especially his two Olympic golds, says Ken. Next runner on the list participated in zero championships and thus have no medals at all. The reason is he competed during World War II. His name was Gunder Hägg. He set three world records and lowered the record to 3:43.0 and set three also at the mile during his phenomenal career which included a total of 16 world records at different distances 1941-1945. – Hägg was very unfortunate that his peak days was during the WWII. What could he have done in the London Olympics in 1948 if he had not been disqualified for being a professional? – My fifth man is Noureddine Morceli. He won the Olympic title in 1996 and his dominance in the World Championships were even more impressive that that of El Guerrouj. The authors of World’s Greatest in Athletics have four of the above on their top-5, but in a slightly different order. In the book you will find merits won for the top-10 and full career story for the authors number one choice which is not Herb Elliot. 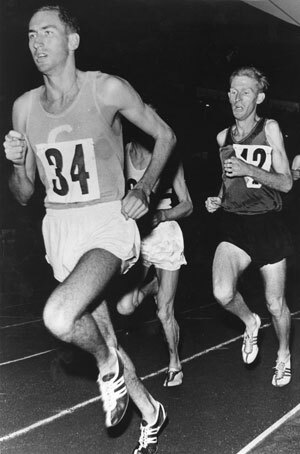 Picture: Herb Elliot ahead of Murray Halberg at Ullevi Stadium in Göteborg in 1960. Regarding who’s the best javelin thrower of all time on the men’s side it should be little discussion. At least according to Anders Borgström (SWE), 69, who is one of the most knowledgeable experts in the world when it comes to javelin throw. Training, technology, aerodynamics, history as well as statistics included. Among others he was head coach for the Swedish national team 1984-1988, javelin coach for Swedish Athletics 1971-1998 and has been working for the javelin manufacturer Nordic Sport since 1973 which has taken him to countless of athletics championships around the world for more than 40 years. He was also an appreciated athletics commentator for Eurosport for many years. 104.80 or 98.48 – what's best? According to Anders there are two performances that really stand out in the history of javelin. – That’s Uwe Hohn’s 104.80 in Berlin, 20 July 1984 with the old implement, and Jan Zelezny’s still standing world record of 98.48 in Jena in May 1996. When Hohn threw 104.80 it was a world record that surpassed Tom Petranoff’s old mark with more than five meters, a true monster throw where he almost hit the high jump pit on the other side of the stadium, says Anders. – Zelezny’s 98.48 came twelve years later with the new model which was introduced in 1986 and he was even more superior to the rest of the world than Hohn. Zelezny is 5.5 meters ahead of number two on the all-time list which is Aki Parviainen (FIN) with 93.09 from 1999. – If we look at the speed the javelin had when the throws were released, the picture is a little unclear, and I don’t know if any specific measuring was done for Zelezny’s 98.48. But what I know from other measurements both were throwing with a speed of around 32 m/sec. I would rate Zelezny’s 98.48 as a slightly better performance compared to Hohn’s 104.80, but it’s with a narrow margin! Anders also concider Jan Zelezny the best javelin thrower of all time. Three Olympic gold medals and one silver, three world championship golds and five world records summarize his amazing career pretty good. – He was also very competitive. My strongest memory of Zelezny is from the worlds in Edmonton in 2001 when Aki Parviainen took the lead with a new championship record of 91.31 in the first round. That could have killed anyone, but not Zelezny. His answer came immediately in the second round with 92.80 which gave him the gold. To this day that’s a result that only Zelezny and Parviainen (once) has surpassed. – Zelezny was an easy pic for me. Janis Lusis was ranked #1 in the world nine times during the 1960’s and 70’s, he was European champion four times and won the 1968 Olympic title with a final round effort over 90 metres. Andreas Thorkildsen has two Olympic titles as well as World and European golds and Steve Backley should also be on the list with his four European victories, says Anders. – The hard part is Uwe Hohn who had a very short career in the middle of the 1980’s and won just one title, the Europeans in 1982. But he never got the chance in the Olympics in Los Angeles 1984 due to the boycott, and should have won there. Close consideration for the Swede Eric Lemming and Matti Järvinen from Finland. – My father was a close friend of Eric who won four Olympic gold medals in javelin 1906-1912 and also was the first official world record holder with 62.32 in 1912. Matti Järvinen won the Olympic title in 1932, became European champion twice and set ten world records. The authors of World’s Greatest of Athletics have all five above on their top-10 list, but in a slightly different order. However, the best thing is that you will find the full story of Zelezny’s career including the best merits for each one of the top athletes in the book. Carolina Klüft is the second best heptathlete of all time and Sweden's best track star ever. She was unbeaten for six years from age 19 in 2002 to the end of her career and won three World titles, two Euro golds and became Olympic champion in Athens in 2004. Her last heptathlon was at the World champs in Osaka in 2007 when she set the still standing European record of 7032 points which put her on second place on the all-time list behind Jackie Joyner-Kersee. Klüft is also ranked as the second best heptathlete of all time behind JJK in the book worldsgreatestinathletics.com in which you will find her wonderful story. In this 15 minute video clip she is speaking (in English) about how she won her second World junior title, in Jamaica in 2002 in a world junior record, and what she learned for life during the final event. Watch Carolina Klüft's speech which took part in Växjö, where she grew up, in November 2014. The history of track and field is full of great athletes and one of them is US hurdler Gail Devers who had a long and glorious career 1988-2004. Her best event was 100m hurdles in which the authors of World's Greatest in Athletics rank her #1 of all time despite she has no Olympic gold and not even a medal. But she has two individual Olympic titles at the distance without hurdles since the 100m flat was her second event which she won in Barcelona in 1992 and on home soil in Atlanta in 1996. The story behind these two victories are special since the total winning margin was less than one hundredths of a second. Devers was born in Seattle, but grew up in National City, California, and graduated from Sweetwater High School in 1984. She made her Olympic debut in Seoul 1988, but her body was off, and she was last in her semi-final. In retrospect she realised that she was already ill. Over the next two years she was unable to compete, suffering from Graves Disease, although it was not correctly diagnosed until the beginning of 1991. In the 1992 Olympic hurdle final she was in the lead over the final barrier but fell and finished fifth, and in Atlanta four years later she was 0.01 from the bronze medal finishing fourth. It was at the World championships she had her success with three gold medals and two silvers at 100m hurdle, winning in Stuttgart 1993, Göteborg 1995 and Seville 1999. Her best time is 12.33 from 2000 which put her on sixth place on the all-time list. Gail left the international scene after 2004 but continued training just because her love of the sport and was timed 7.86 at 60m hurdles at age 40 in 2007. She now runs the Gail Devers Foundation, set up in 1999, and is an accomplished public speaker. Her story is published in World's Greatest in Athletics including the list of the 10 best short hurdlers of all time. The book World’s Greatest in Athletics includes a never before published ranking of the all-time top-10 in all standard events based on merits. The criteria used for the ranking is the following: How successful was the athlete in terms of championships and record performances, and how long did he or she stay at the top. There is no ”final answers” in this matters, but it's a very well motivated ranking by the authors. To compare with what the authors came up with we have asked a few other experts about their list in a few events and this time we picked women’s 400m hurdles. Asked for the top-5 list was IAAF web editor Jon Mulkeen (GBR). – Sally Gunnell is the only woman in history to have won world and Olympic titles in the 400m hurdles as well as set a world record in the event. That's enough to earn the No.1 spot on this list, says Jon. Gunnell was at her top 1992-1994 when she won the Olympic title in Barcelona, the World championships in Stuttgart in a world record time of 52.74 the following year and finally gold at the Europeans in Helsinki in 1994. – Behind her, it gets pretty close. Like Gunnell, Kim Batten set a world record en route to winning the world title in Göteborg in 1995 (52.61). Yuliya Pechonkina has a full set of World Championships medals and her world record has stood the test of time (12 years). Melaine Walker has never set a world record, but has two global titles while her compatriot Deon Hemmings has 'just' one. The authors of World’s Greatest of Athletics have all five above on their top-10 list, but in a quiet different order. However, the best thing is that you will find all the merits for each one of the top athletes in the book. The quarter mile for men is almost like a national event in the US with endless of great runners and they also dominate the one lapper like no other country. The US have won 20 Olympic gold medals of 27 possible and have 9 of the 10 top spots on the all-time list. But who's the greatest 400m runner of all time? We asked IAAF web editor Jon Mulkeen (GBR) what his top-5 all-time list based on merits would look like and got a list with five americans! – Michael Johnson stands head and shoulders above anyone else. Two Olympic titles, four world titles and a long-standing world record makes him the best 400m runner in history. He dominated the event for a whole decade between 1990 and 2000 and became the first man to win two Olympic titles in the event. He wasn't too bad at the 200m either! says Jon. His pic for second spot is a guy from the 1960s and 70s. – Lee Evans broke barriers when he became the first man to run faster than 44 seconds. His record, set at the Mexico City Olympics in 1968 for good measure, lasted for 19 years. Jeremy Wariner and LaShawn Merritt have each won numerous global titles and so deserve a place among the top five of all time. Butch Reynolds never won a global title, but came close on a few occasions. And his world record of 43.29 is a time that has only once been bettered, says Jon. In the book World's Greatest in Athletics you will find a top-10 ranking in all events done by Richard Hymans, Peter Matthews and Jonas Hedman. It also include 500 deep all-time lists in all events, and in 400m it goes down to 45.38 for #500. The number of americans appearing in the list is an amazing 238 (46%). Women’s marathon is a quite new event since its Olympic debut was as late as the Olympic Games in Los Angeles in 1984. The overwhelming winner in that race was Joan Benoit, USA, who ran solo for 39km and won with almost 1,5 minutes. How would she be rated in competition with the best marathoners of all time? We asked Eurosport marathon commentator and former middle distance runner Daniel Norberg (SWE) what his top-5 all-time list would look like and got five names some interesting thoughts. – This was not easy! Medals in global championships is a key point here but fast times and records of course counts too. I focused on the latter when I picked Paula Radcliffe as #1. She only has one gold medal in marathon – from the World championships in Helsinki in 2005 – but her outstanding times in London 2002 (2:17:18) and 2003 (2:15:25) were really something special since she’s more than three minutes faster than #2 on the all-time stat list, says Daniel. – Second place on the list is a close battle between Catherine Ndereba and Grete Waitz. I choose Ndereba since she has two golds from World championships, two Olympic silver medals and is one of only four which have ran under 2:19 (2:18:47 in Chicago in 2001). She also has several wins in international marathons. – Grete Waitz was a pioneer in the event at the end of the 1970’s and took the world record from 2:32 in 1978 to 2:25 in 1983. She was also the inaugural World champion in Helsinki 1983 and was second in the 1984 Olympics. – On fourth place I have Rosa Mota (POR) which was a great championship runner with victories at the Worlds in Rome in 1987 and the Olympics in 1988 as well as three straight golds at the European championships. Her winning margin in Rome ’87 is the biggest ever in a championship marathon, says Daniel. – Then I have Joan Benoit Samuelson on fifth spot. She won the first Olympic female marathon contested and also set a world record when running 2:21:21 in Chicago in 1985. And this amazing woman is still running marathons, 2:54 in Chicago 2015 at age 58! – Finally I will give Manuela Machado (POR) a honourable mention. She never ran a really fast time but won the 1995 World title in Göteborg, was second in 1997 and took the Euro title twice, says Daniel. Learn more about the best marathon runner's of all time and the other events in World's Greatest in Athletics. Who’s the best male discus thrower of all time? The Discus is one of only twelve events that has been on the Olympic programme since Athens 1896 and during the past one hundred years it’s interesting to see how many great throwers have had such long and successful careers. We asked Vésteinn Hafsteinsson (ICE), who coached Gerd Kanter to World and Olympic gold in 2007-2008, what his top-5 all-time ranking list would look like. Vésteinn has been in the event for more than 35 years and himself competed in four Olympics with a pb of 67.64 (1989). – To me, there’s one man who really stands out, and that’s Al Oerter. He won four Olympic golds 1956-68 and set a PB in three of the Games. He was only 20 years old when he won for the first time in Melbourne in 1956 and that’s very unusual in discus. Usually the winner, and medallists, are at least 25-26, says Vésteinn. – On second place I put Virgilijus Alekna, who is second on the all-time list with 73.88 from 2000. He won two Olympic titles, 2000 and 2004, and he’s was very consistent on a high level for many years. – Some discus experts have Alekna as number one but for me Al Oerter is the best. To be at its best when it really counts four times within a time span of twelve years is really fantastic. He also set four world records. – It was hard to pick those five names since there have been so many good throwers over the years. Robert Harting (GER), Ludvik Danek (TCH) and Wolfgang Schmidt (GER) were very close making the list. I also missed to have my own former athlete Gerd Kanter on this list to choose from, of course he is one of the best. Vésteinn is today coaching among others Swede Daniel Ståhl who was fifth at the World Championships in Beijing in 2015 and his team of throwers in could be followed at www.globalthrowing.com. One of many great stories in World's Greatest in Athletics is the one about Al Oerter which really is one of the most amazing ones in the history of athletics. ALLYSON Felix (USA) is one of the greatest sprinters of all time when it comes to the number of world and Olympic medals. She has three at 200m in the Olympics 2004-2012, including gold in London 2012, and four at World Championships 2005-2011 including three golds. Add to that world gold and silver att 400m and a total of 10 relay medals! There are many fabulous Olympic performances in the sport of athletics and here are four guys who really did unreal things. Javelin thrower Jan Zelezny won silver in Seoul in 1988, only 16 cm behind the winner and then continued with three straight golds – Barcelona 1992, Atlanta 1996 and Sydney 2000. Triple Jumper Viktor Saneyev won gold in his Olympic debut in Mexico City in 1968 and then repeated in Munich 1972 and Montreal 1976, and finally, on home soil in in Moscow 1980, took the bronze in 17.24, only 11 cm behind the winner. And then we have the americans Al Oerter (discus throw) and Carl Lewis (long jump). Oerter won in Melbourne in 1956 at age 20, and then in Rome 1960, Tokyo 1964 and Mexico City 1968 setting PBs in three of the Games. Ps And then there's also Ray Ewry (USA) who took four straight golds in the since long discontinued events standing HJ and LJ 1900-1908 (the intercalated Games in Athens 1906 included). We got the idea of this book in 2010 and started working on it the year after with the very first meeting in London in April where Richard Hymans and I met (picture; Peter Matthews was unable to attend). Who is really the best 110m hurdler of all time? Who is #1 in women's 10,000m? And who might be on top of men's shot put? These and a lot of other questions on the top-10 ranking lists slowly took form. Now we have the answer, or more correct our pics, of the number 1-10 in each event. It's been a long road but finally the book was sent to the printer a few weeks ago and will be ready for distribution in the beginning of December. For all track and field fans: this is a book we hope you will enjoy!